This week Marti Challenged the Creative Inspirations Paint Team to use a sketch along with our paints. This week, instead of using the paints with an H20 Brush, I applied them with an Ink Blending Tool. I covered some Grunge Paper with an old dictionary page, than ran it through my Big Shot, using the Flower Layers #2 die. When using dies, it's much easier to cover your Grunge Paper, before die cutting. Once my pieces where die cut, I used the Ink Blending Tool to apply Creative Inspirations Tickled Pink Paint to my pieces. After letting them dry, I glued them together, and placed them on my stamped panel. I added the Silver Bottle Cap to the center, then flower center, and filled in the bottle cap with Ice Resin. I just love how shimmery the paints look on my flower. Thanks for stopping by! Looking for more inspiration using this weeks Challenge Sketch and Creative Inspirations Paint, click the logo on my side bar to see what the other designers created this week. A Team Members are creating this week, B Team Members will be sharing their sketch cards next Thursday. this is SO gorgeous! 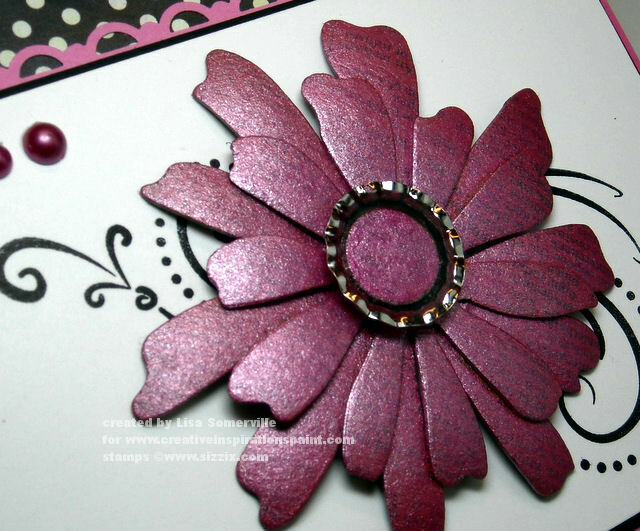 lovin that die cut too and using the bottle cap in the center! 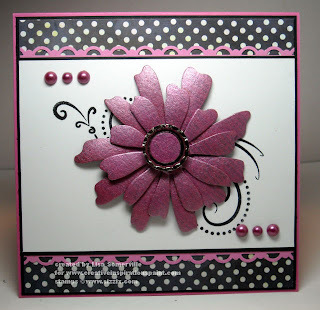 Lovely card, I love your clean lines on this one! That is a beautiful car Lisa. It really shows off the shimmer of the paints too! I love the intense color on the dictionary paper. How beautiful! Oh my, Lisa! This is absolutely gorgeous! That flower is SO vibrant! The paint really makes it pop! Especially against the white background! WOW! Amazing!!!! great card, really nice shimmer and color! Wow! This is absolutely gorgeous--love that flower! Gorgeous, Gorgeous and more gorgeous! The color is wonderful, love the bottlecap in the center-that really shows off the sparkle! Wow!!! Wow!! 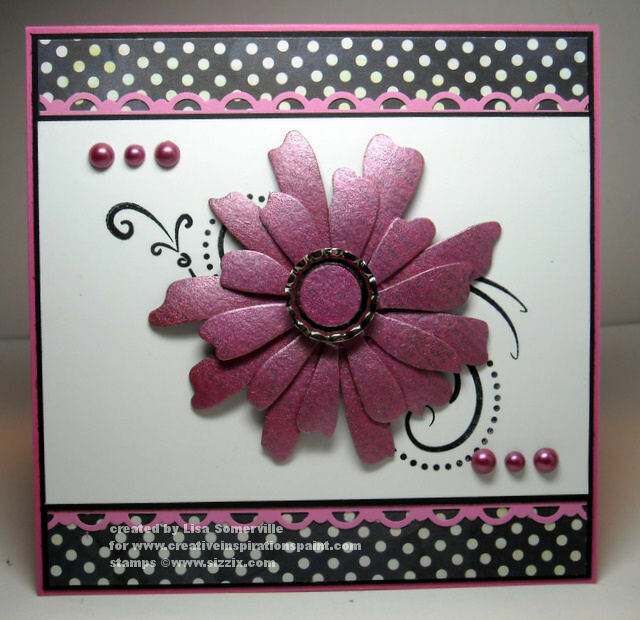 I love this card, those flowers are awesome! LOVE, LOVE, LOVE that card and especially the colors! Okay saw this while I was looking for the PDCC card! All I can say is this is stunning! I love this! I don't quiet understand the technique you are describing - I saw that you have a video too - perhaps you could do a video on this technique as well!